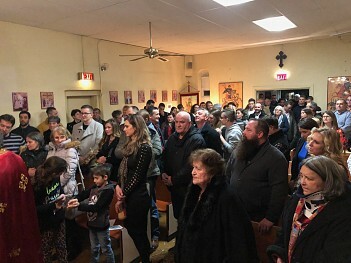 On January 6, 2019 at St. George Serbian Orthodox Church in Cincinnati, Ohio, people gathered to celebrate Badnje Veče (Christmas Eve) in traditional fashion. Our faithful came from all over the tri-state area to be a part of this most special evening, keeping the Serbian tradition alive by passing it on to their children. Father Petar Petrović led the vesperal prayers, assisted by the Church Choir led by long-time director Nancy Helbich. At the conclusion of the service, Father Petar read the message from Bishop IRINEJ in both Serbian and English and the message was well-received by all. 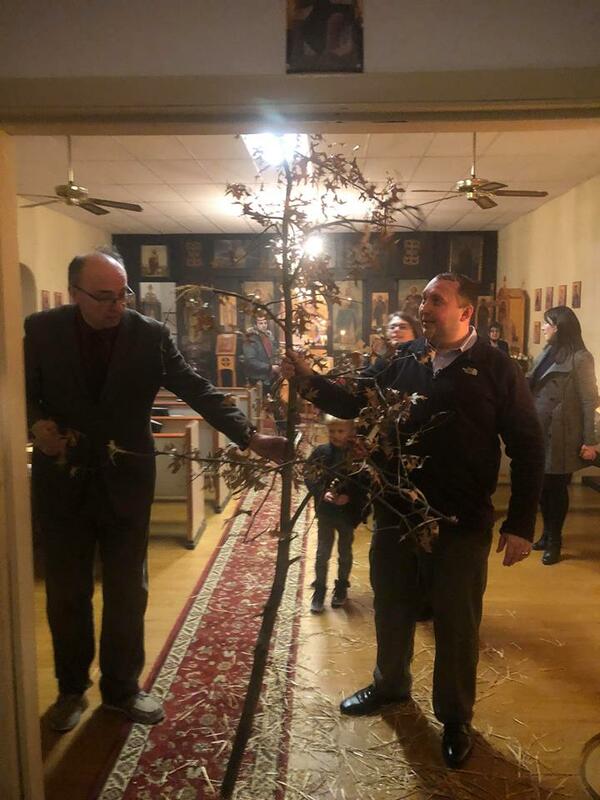 Following the Vespers service, the Yule Log was brought in the Church by Parish Council President Milan Obradović and the path of straw laid by 2ndVice President Dragan Miljković. The tradition of placing a path of straw for the entrance of the Yule Log is symbolic of our Savior’s entrance into this World – the God Child (Yule Log) born of a young virgin mother in a stable and placed in a manger (straw) to rest. The humblest of births is remembered by this ancient tradition of the Serbian people. The faithful came forward at the end of announcements to venerate the icons and the Holy Cross and received a blessing from Father Petar. Wall calendars were also distributed from KSS President Dr. Jasmina Jović. Mira Stratton, First Church Board Vice-President, distributed to all children Christmas Magazine Book. Christmas gifts sponsored by Birgir Mishurda and Family were distributed to all children . Before heading to the Fellowship Hall for a fasting dinner, everyone gathered around a small fire as the Yule Log was set ablaze. Thanks to our brothers and sisters who decorated the hall, prepared a nice “fast-friendly” meal, and for the traditional Shumadijski Chaj (hot tea). Everyone enjoyed the meal and also the special visit by St. Nicholas, who distributed gifts to the children. Glory to God that our Lord was sent to us over 2000 years ago and may the New Year bring blessings to you and your family! May we remember to be good stewards to our Church in 2019 and to be the “light of the world” to those outside of our faith through our words and our deeds. HRISTOS SE RODI! Христос се роди!